Took the big fella to the dog park the day after Christmas and ran him for an hour and a half. Good times, he loved it. Other than him getting a bit tired near the end I didn't notice that anything was wrong. When we got home and I hosed him off (couldn't keep him out of the water...), he was holding his foot up. I took a peek and noticed that a huge chunk of skin from his pad was gone. Ouch! That's why I love dogs. He would have retrieved his 'squirrel' all day with his foot like that, thinking that is what I wanted him to do. No complaints. I take that back. He's complaining today. He is a mopey whine-a-saur. He's sitting next to me as I type with his head on my lap feeling sorry for himself. 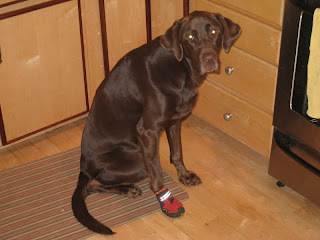 To keep him from licking his wound, we bandaged it up and put on a dog sock and shoe over it to keep it clean and together. He's not a fan as you may be able to tell from the above picture. The good news is that I am now finally confident to take him out hiking with me. If I can keep him close to me at a dog park with hundreds of dogs running around (for the most part he ignores them) I'll have no problem in the woods.